Brilliant design & sturdy constuction arrive to you in the form of the Pro-Line Adjustable Breathable Back Office Chair. 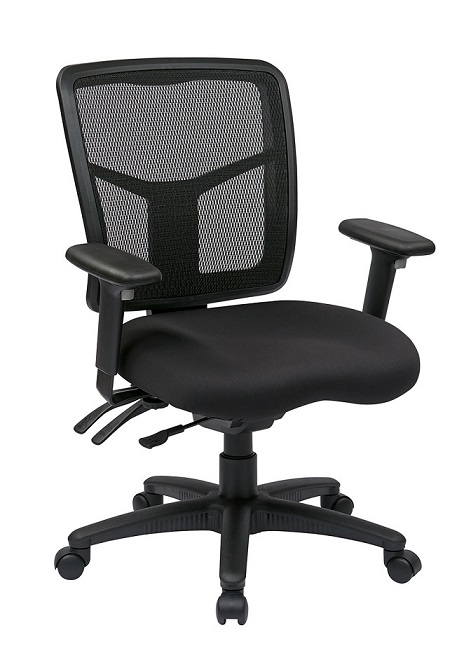 A combination of durable fabrication and modern style, this interweave mesh back seating option features one touch pressurized seat height adjustment for easy customization, dual function control for added comfort, and back height adjustment that accomidates folks of large and small statures alike. A contoured molded foam seat provides for hours of comfortable support while the 3-way adjustable padded arms allow you to tailor the chair to your own individual comfort level. Situated atop a durable nylon base upon 5 dual wheel carpet casters, this chair moves effortlessly from desk to fax machine with mininal effort. With all these features, this dynamic office chair will be your favorite office seating option for years to come. Add to cart now for online savings on this durable office chair.